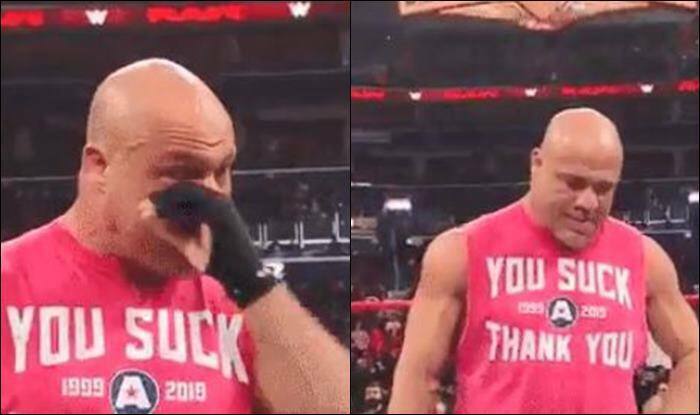 Ahead of his final match at Wrestlemania 35, Kurt Angle was paid a tribute from Monday Night RAW which left him as well the audience in the arena, emotional. World Wrestling Entertainment (WWE) Hall of Famer Kurt Angle’s farewell tour will be making its conclusion when he takes on Baron Corbins at Wrestlemania 35 pay-per-view event. Ahead of his last match, Angle made his final appearance on Monday Night RAW and was paid a tribute for his illustrious career in the WWE. “I want you to know how appreciative I am for the good times, the bad times. I’ve heard a lot of boos, but mostly cheers. From the bottom of my heart, I want to say thank you,” said an emotional Kurt after watching the video montage of his career. “I wanna thank the McMahon family for allowing me to pick my opponent for my farewell match. There are so many superstars I would love to face, but there’s only one I want to beat. And he’s the man that has made my life a living hell since I’ve been the General Manager of Monday Night RAW. That man is Baron Corbin. Nothing will make me happier than to make Baron Corbin tap out at WrestleMania and I can end my career the happiest man in the world,” he said. Although Kurt Angle was scheduled to take on Rey Mysterio in RAW, that match was called off. Adding more drama to the match ahead of their clash at Wrestlemania, Corbin made an interference to mock the legend. “Aww, Kurt. Am I interrupting a stroll through memory lane? It should’ve been in black and white because it’s ancient history. The man standing in that ring struggles to take his jacket off and can’t go two to three minutes without huffing or puffing,” he said. The Olympic gold medallist had earlier announced that he will be wrestling his last match at the upcoming pay-per-view. Although the fans weren’t impressed by his opponent Baron Corbin. The audience at the Allstate Arena in Chicago had booed when Corbin was announced as the opponent. Kurt Angle has mostly wrestled in the WWE and TNA. However, he wasn’t an in-ring regular ever since his return from TNA. Kurt mostly played the role of the General manager of WWE’S weekly RAW, only making occasional appearances in the ring during special events. His previous match against Baron Corbin ended in his favor.